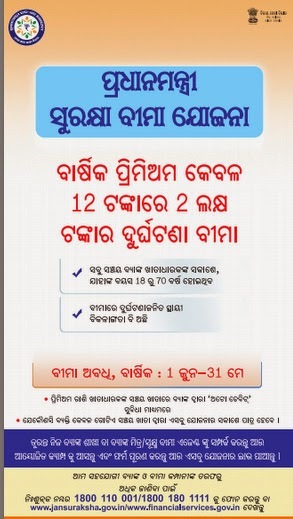 The PMSBY scheme will be a one year cover, renewable from year to year, Accident Insurance Scheme offering accidental death and disability cover for death or disability on account of an accident. 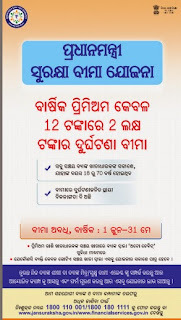 The cover shall be for the one year period stretching from 1st June to 31st May for which option to join / pay by auto-debit from the designated savings bank account will be required to be given by 31st May of every year, extendable up to 31st August 2015 in the initial year. Initially on launch, the period for joining may be extended by Govt. of India for another three months, i.e. up to 30th of November, 2015. Joining subsequently on payment of full annual premium may be possible on specified terms. However, applicants may give an indefinite / longer option for enrolment / auto-debit, subject to continuation of the scheme with terms as may be revised on the basis of past experience. Individuals who exit the scheme at any point may re-join the scheme in future years through the above modality. New entrants into the eligible category from year to year or currently eligible individuals who did not join earlier shall be able to join in future years while the scheme is continuing. The premium would be reviewed based on annual claims experience. However, barring unforeseen adverse outcomes of extreme nature, efforts would be made to ensure that there is no upward revision of premium in the first three years. The scheme is liable to be discontinued prior to commencement of a new future renewal date if circumstances so require. 1. On attaining age 70 years (age nearest birth day). 2. Closure of account with the Bank or insufficiency of balance to keep the insurance in force. 3. In case a member is covered through more than one account and premium is received by the Insurance Company inadvertently, insurance cover will be restricted to one only and the premium shall be liable to be forfeited. 4. If the insurance cover is ceased due to any technical reasons such as insufficient balance on due date or due to any administrative issues, the same can be reinstated on receipt of full annual premium, subject to conditions that may be laid down. During this period, the risk cover will be suspended and reinstatement of risk cover will be at the sole discretion of Insurance Company. 5. Participating banks will deduct the premium amount in the same month when the auto debit option is given, preferably in May of every year, and remit the amount due to the Insurance Company in that month itself.